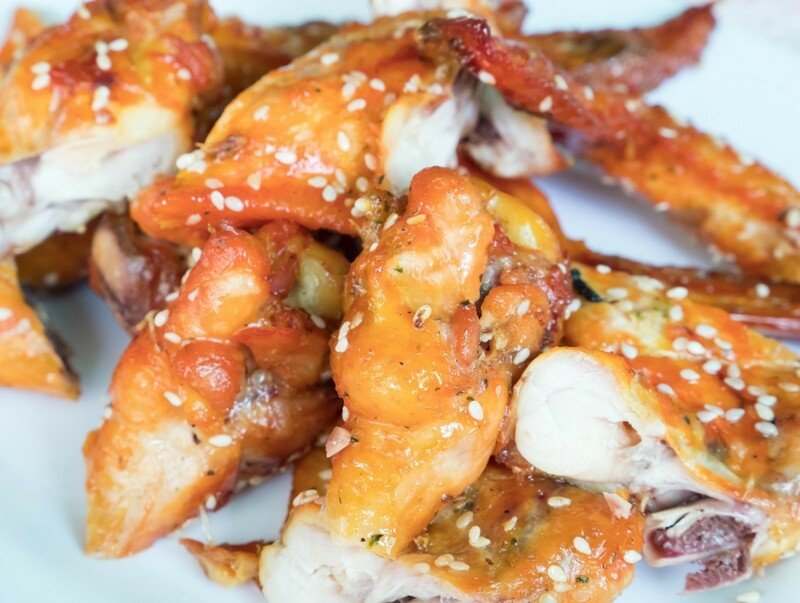 There are many variations of sesame chicken for you to try. Find your favorite one. This page contains baked sesame chicken recipes. Combine ingredients, except chicken, in a large bowl. Add chicken, coat well, cover and refrigerate for at least two hours, turning at least once. Transfer chicken to a baking dish (discard marinade) and bake chicken uncovered at 425 degrees F. for about 45 minutes, turning once after about 25 minutes. Mix 1/4 cup soup, 1/4 cup milk and 1/8 tsp. poultry seasoning. Dip chicken in soup mixture; then roll in mixture of corn flakes and sesame seeds. Place in foil-lined shallow baking dish. Drizzle with butter. Bake at 400 degrees F for 1 hour. Meanwhile, combine remaining soup, milk and poultry seasoning. Heat; stir now and then. Serve over chicken. I just made your Sesame Chicken, and used what I had on hand. I had some rice krispie cereal rather than the corn flakes, and flax seed rather than the sesame seeds. Boy did it turn out great. I had friends over for dinner too and it was a real hit. Thank you. Can any one help me with a recipe for sesame seed chicken. I had it and loved it. Now I want to make it. Here are several versions that I've saved to try. Hope one of them helps you! For immediate cooking: Pre-heat oven to 350 degrees F. Place all ingredients into a large baking dish, turn chicken to coat. Bake until chicken juices run clear (45-60 minutes for chicken pieces, or 20-30 minutes for chicken breasts). To thaw and cook: Take the bag out of the freezer the night before, make sure the baggie is completely closed. Place the Bag on a shelf furthest from the freezer (It works best if the bag is laying flat, although this may not be the best option with a side-by-side fridge/freezer). Preheat the oven to 350 degrees F. Empty the contents of the bag into a large baking dish and bake until the juices run clear (45-60 minutes for chicken pieces, or 20-30 minutes for chicken breasts). 2 lbs. skinless, boneless chicken thighs. Place chicken thighs in the slow cooker. Whisk together remaining ingredients in a bowl and pour over chicken. Cover and cook on low 6 to 8 hours or on high 3 or 4.
then drizzled with butter and baked." 2. Place soy sauce in a 9x13 inch baking dish. On a piece of wax paper, mix together the sesame seeds, flour, salt and pepper. Dip the chicken pieces in the soy sauce to coat, then dredge in the sesame seed mixture. Arrange in baking dish in a single layer, then drizzle with melted butter. 3. Bake at 400 degrees F (200 degrees C) for approximately 40 minutes, or until chicken is cooked through and tender and juices run clear. Baste with drippings once during cooking time. Garnish with extra sesame seeds if desired, and serve. Cut the chicken into 1-inch cubes. Mix the marinade ingredients and marinate the chicken for 20 minutes. To prepare the sauce: mix together all of the sauce ingredients. Pour them into a small pot and bring to a boil, stirring continuously. Turn the heat down to low and keep warm while you are deep-frying the chicken. To deep-fry the chicken: add the marinated chicken pieces a few at a time, and deep-fry until golden brown. Drain on paper towels. Repeat with the remainder of the chicken. Just before you are finished deep-frying, bring the sauce back up to a boil. Place the chicken on a large platter and pour the sauce over. Sprinkle with sesame seeds. Serve the Sesame Chicken with rice. And a Weight Watchers version! Place soy sauce in a shallow dish; add chicken, turning to coat. Remove chicken from soy sauce; discard soy sauce. Combine sesame seeds and next 3 ingredients in a large zip-top heavy-duty plastic bag. Add chicken; seal bag, and shake to coat chicken with sesame seed mixture. Place chicken in a 13- x 9- x 2-inch baking dish coated with cooking spray. Drizzle margarine over chicken. Bake at 400 degrees for 45 minutes or until done. Yield: 4 servings (serving size: 1 chicken breast half). 1. To Make Marinade: In a nonporous dish or bowl blend cornstarch with wine or sherry; then stir in lemon juice, soy sauce, hot pepper sauce, ginger and garlic. Blend together and stir in chicken strips. Cover dish and refrigerate to marinate for 3 to 4 hours. 2. In a wok or large skillet, place sesame seeds and dry-fry over medium heat, shaking the wok, until the seeds are a golden brown color. Remove seeds and set aside. 3. To same wok or skillet add sesame oil and vegetable oil and heat slowly. Drain chicken, reserving marinade, and stir-fry in wok a few pieces at a time, until browned. Remove chicken with a slotted spoon and set aside. 4. Add mushrooms and green bell pepper to same wok or skillet and stir-fry for 2 to 3 minutes. Add the scallions and stir-fry 1 minute more. Return chicken to wok, together with reserved marinade, and stir over medium high heat for another 2 to 3 minutes, or until the ingredients are evenly coated with the glaze. Sprinkle toasted sesame seeds on top and serve immediately. Sesame Sauce: Combine water, vinegar, salt, sugar, soy sauce and yellow food coloring in a large pot. Cook over medium-high heat for about 20 minutes, until sugar has caramelized. Watch carefully to prevent mixture from boiling over. Set aside. Sesame Seeds: Brown sesame seeds in skillet over medium heat until lightly browned and fragrant, about 5 minutes. Stir frequently. Watch carefully to prevent burning. Chicken: Mix flour, cornstarch, salt and pepper in a bowl. Coat chicken with flour mixture and shake off excess. Pour oil into a large pot to a depth of 3 inches. Heat oil to 350 degrees. Deep fry chicken until crisp and brown, about 5 minutes. Be sure chicken is submerged in oil. Remove chicken from oil and drain on paper towels. Place in a large mixing bowl. Pour sesame sauce over chicken and mix well. Add sesame seeds, combine well. Transfer to serving platter.